These are instant vadas with no grinding or no soaking. And this is a little healthy snack as carrot was added to the flour. I made these on Ganesh Chathurthi day. Add all the ingredients (except oil) in a bowl and mix together to make thick dough using very little water. Keep aside. Pour oil in a deep skillet and heat. When it becomes hot, take small batches of the dough, shape into a small circle and drop carefully into the hot oil. When they become cooked and change color, remove from the hot oil and place on a plate covered with paper towel. Let them cool for some time and eat the yummy vadas. Repeat the same process with remaining dough/batter. Enjoy these yummy vadas any time of the day. Awesome, crispy carrot vadas makes me drool..
Never made fritters only with carrot, nice variation. 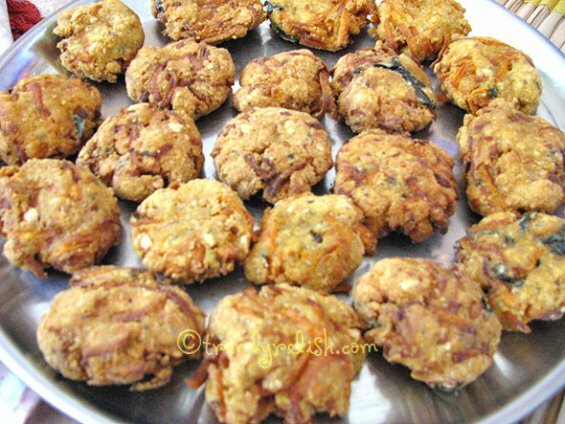 Vadas look so yumm! A great tea-time Snack! Thats a unique vada..looks really yummmy..
lovely and very innovative. the vadas look so crispy and tempting. I love fritters and this one is must try, looks just delicious!! healthy n crispy yummy vadas..
Another different innovation from ur kitchen :) How r u Uma? I just made your radish chutney. Fabulous. 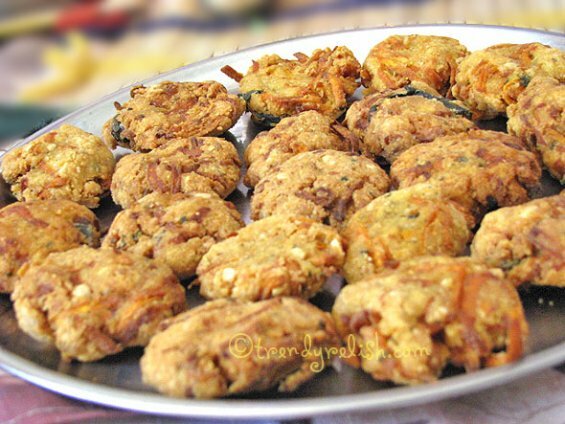 I am now going to make these carrot vada but with radishes (since I had a big radish crop this year). I'll blog about it on my blog, http://www.projectparatha.blogspot.com/. Just discovered your site. Love the bold way you cook.